A couple of weeks ago I was very bummed to find out that I had missed the Sour Cherry season where you actually get to go and pick them yourself. The reason why I was so bummed it was because I love Sour Cherries. 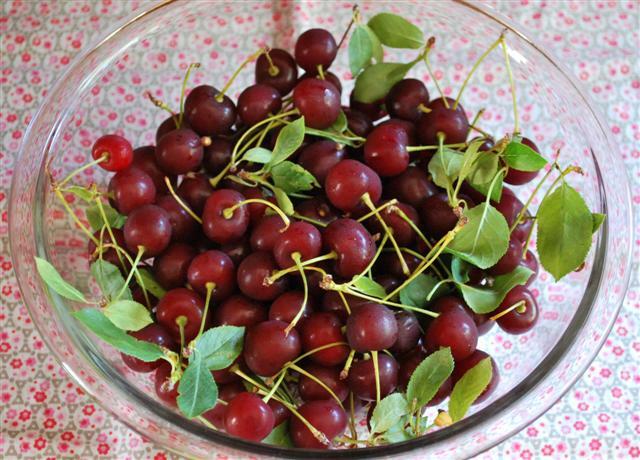 As I wrote on my Sharbateh Albaloo post, it had been years since I had fresh Sour Cherries. Imagine my surprise when I walked into my regular Persian Market and saw a nice stack of boxes sitting there waiting and whispering my name. I looked at the price, took a double look and nearly fainted. Then I picked up a box and placed it in my basket and said “I the name of childhood memories and my blog I shall splurge today.” Then I handed the cashier my debit card and spent $7.99 of my husband’s hard earned money on Albaloo. I couldn’t wait to get home and have a little taste! Oh how good they were, so nice and SOUR! I was so so excited because I knew exactly what I was going to do with the big box. There was not one ounce of doubt it my mind. 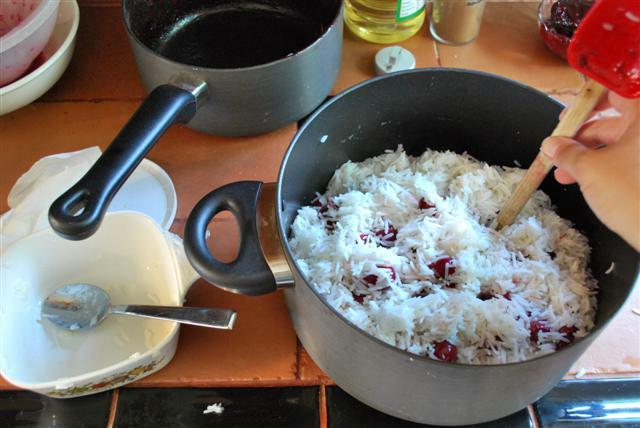 I was a woman on a mission: I was going to make Albaloo Polow with fresh sour cherries and it was not going to be sweet. Period. Here is the thing, I am not into food that is sweet. Nop, not me. 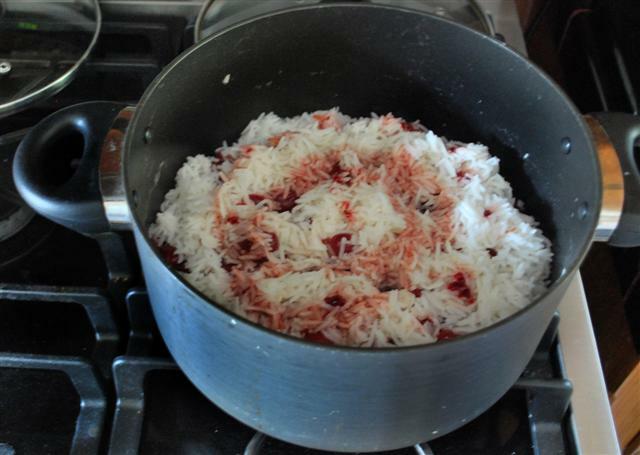 As much as I love Albaloo Polow I never order it when going to restaurants because it seems like they always take Sour Cherry preserve, add some saffron to rice and mix it all together. The result is sweet, syrupy sweet. I am not down with syrupy sweet. Not me. 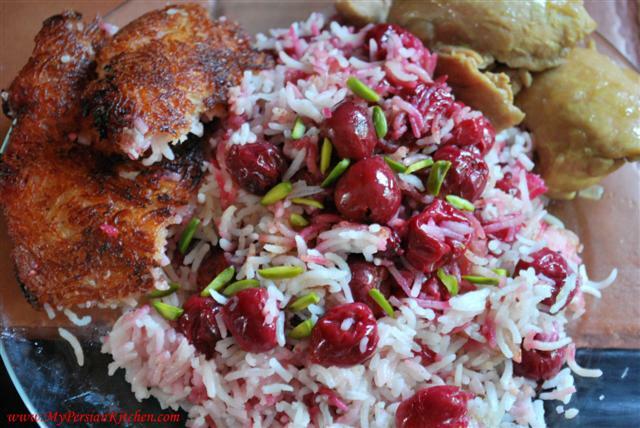 I consulted a few books for Albaloo Polow and then I walked into wait wait wait, here it comes, My Persian Kitchen, and took out my box of cherries from the fridge. 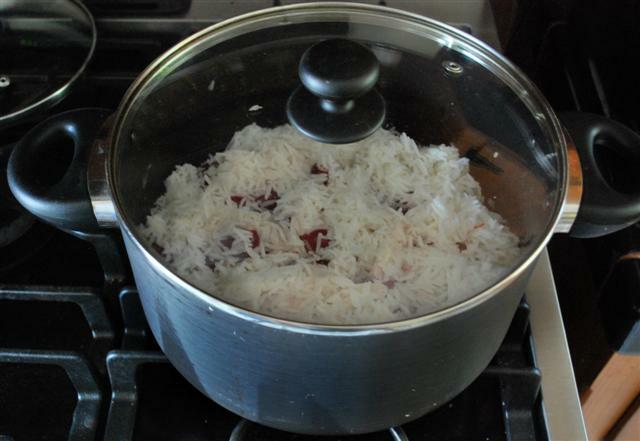 This was my first time making Albaloo Polow and I was pretty happy with the results. It was a delicious combination of tart and delicious Persian spices. I even got creative and made a chicken dish to go with the rice. I was pleasantly surprised that The Sous Chef really liked this dish as well. You see, there is a little bit of a battle going on in this house. The Sous Chef likes a very loud and strong explosion of flavors when eating food. I am all about the subtleness of flavors where you can actual taste the ingredients instead of just the spices that are used. This rice is exactly that, subtle in deliciousness. Each bite was filled with the tartness of the sour cherries and a combination of Advieh and saffron. I would say it was a delicate taste which is what I really enjoyed. It became even better with the juices from the chicken because it added yet another layer of flavor to it. Here is the most time consuming part of this recipe. But I promise you, it will be worth the effort and time. It makes such a huge huge huge difference in taste when using fresh sour cherries. 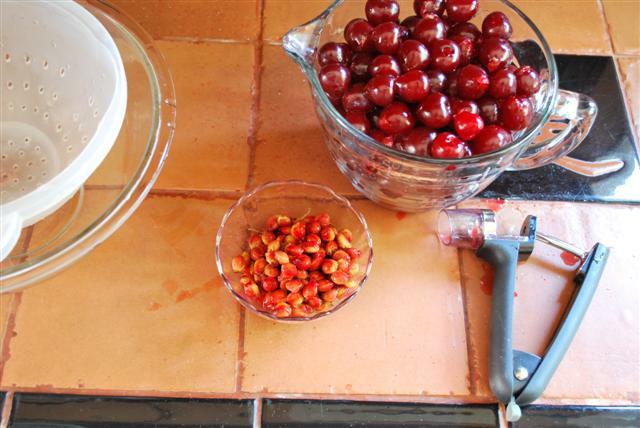 Make sure all the sour cherries are pitted. You do not want a little surprise when chewing later on. 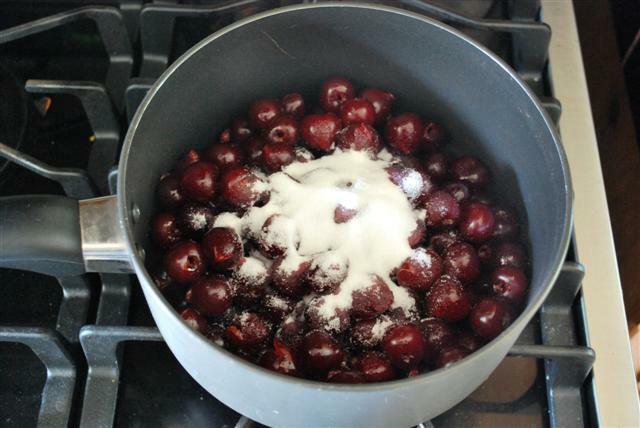 Place the pitted sour cherries in a pot, add the sugar on top. Give it a gentle stir and simmer on medium for 15 minutes. Place a bowl under a colander. 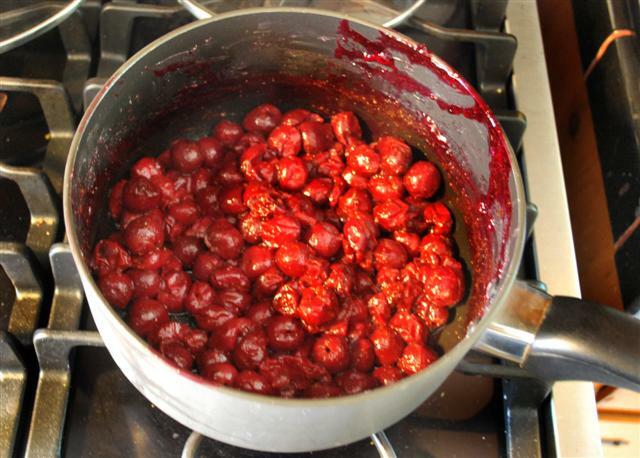 Place the cherries in the colander and let the juices drain. 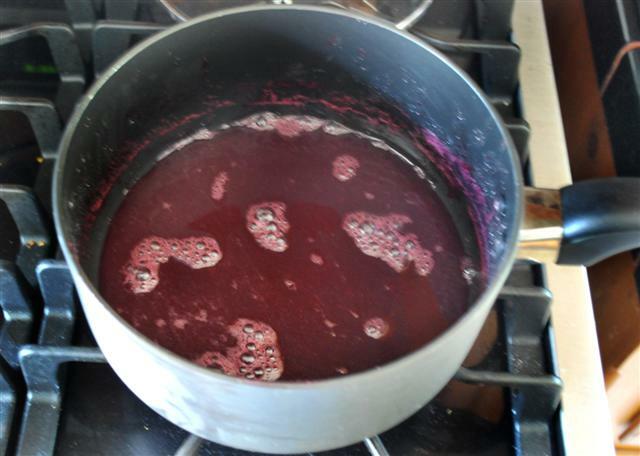 Return the juices to the pot and let reduce for about 10 minutes. If the end result is jelly like, don’t worry. It is perfectly OK. Set the syrup aside. Place 2 tbsp of butter in a sauce pan (you can use the same, just like I did if you want). Let it melt. Add 1 tbsp of advieh and give it an nice stir. 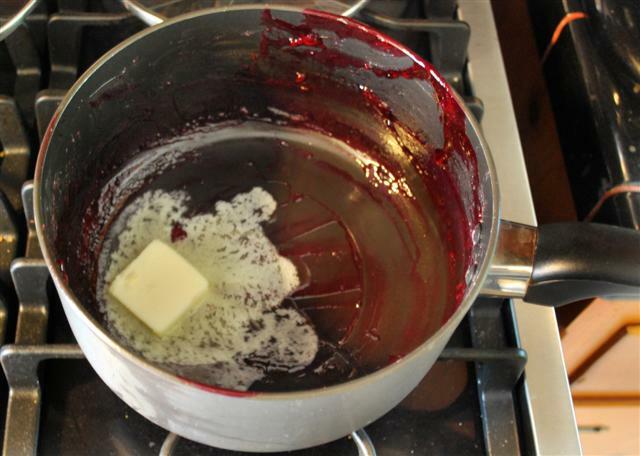 Turn off the flame and add the cherries mixing it well so that the cherries are coated with the butter and advieh. In the mean time make your rice according to the Chelow recipe. Make sure that the water for the rice is well seasoned with salt. 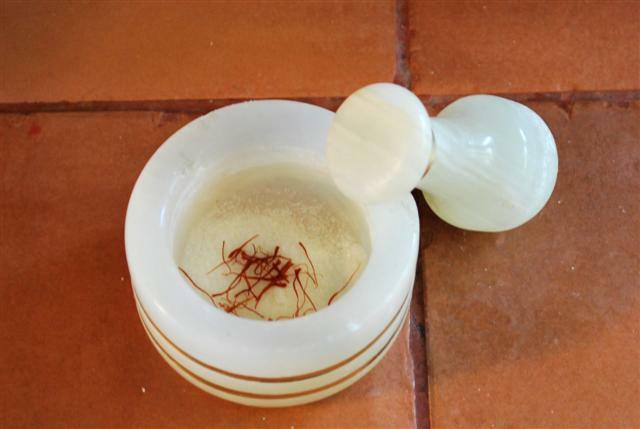 When making saffron for the tahdig reserve a little bit for later, I would say about 1 tsp. Go ahead and built the first layer of rice with yogurt and saffron. Make sure that the bottom of your pan is covered with a thin layer of water and oil. Pour some rice on top. Then place half of the sour cherries on top. 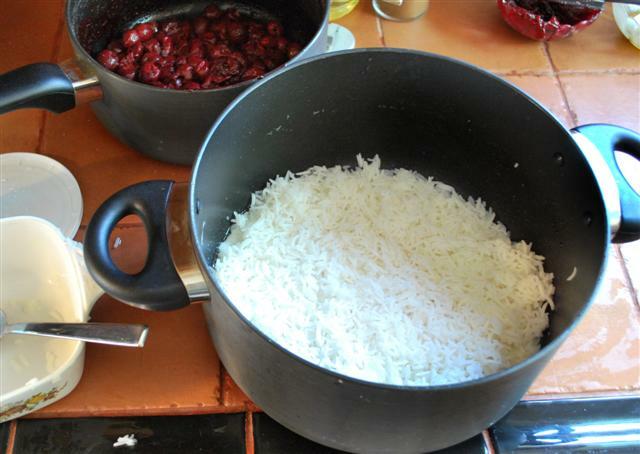 Give it a gentle stir to mix the sour cherries with the rice. 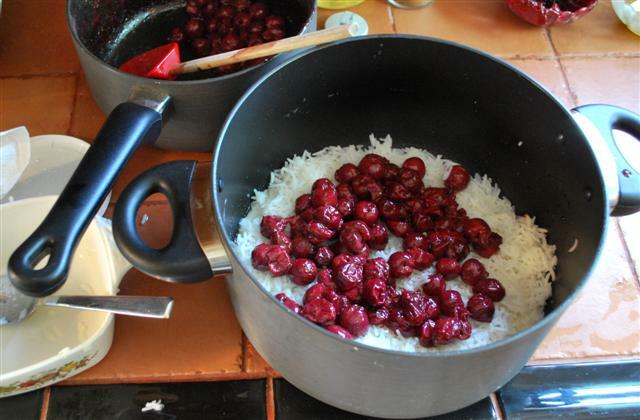 Repeat with the rest of the rice and cherries. Always finish with a layer of rice and make sure that it is in the form of a pyramid. With the back of a spatula make some holes making sure that you stop before the bottom layer, where the rice and yogurt mixture is. Cover and cook on high for 10 minutes. In the mean time melt 2 tbsp of butter, mix in 1 tbsp of the syrup, the remaining saffron, and 1 tsp of advieh. Pour over the rice. 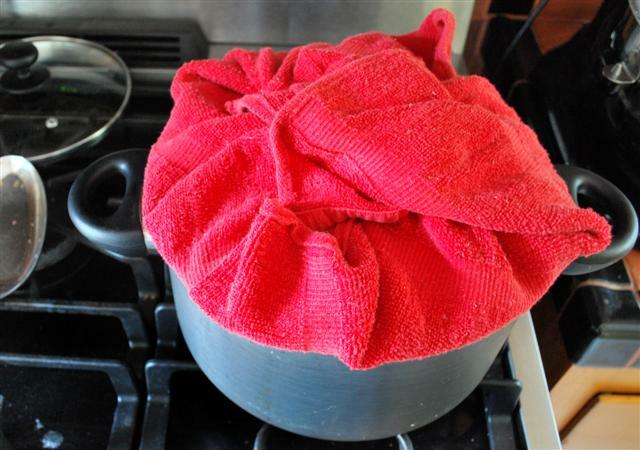 Cover the lid with a cloth and cook for 1 hour on medium low. When done place the rice in a platter and sprinkle the slivered pistachios on top. Serve with Chicken with Sour Cherry Syrup. khoshhalam az inke inja ro peyda kardam. Adrese website shoma ro yek doost az Miami ke dastoore koofteh az man mikhast behem dad. manam nazdik be 1 sale ke ye blog shabihe site shoma daram. khoshhal misham sar bezanid va nzar bedid. khoshhalm ke shoma ham az ghazaieh irani sohbat mikonin. salam az Los Angeles! from another Persian cooking weblog i came here. its’ great, thank you. you explain each and every details, its’ awesome. i love albalo polo. my mom sometimes makes it with small meat balls. anyhow, keep it up, waiting for more delicious recipes. Thank you for your kind words Maryam. Some people indeed layer the rice with either chicken or meatballs. I have always had it with chicken on the side. thank you for stopping by! I tried your recipe for the tahdig and it was amazing . I am not persian and have never cooked persian food before. The tahdig was amazing and i am tried the albaloo polo tonight. I am sure it will be amazing. Great blog . Great recipes and very helpful pictures and notes. thank you for your kind words. I am so excited to hear that you liked the rice. Tahdig is indeed delicious! I can’t wait to hear about albaloo polow. You are welcome Parisa! Let me know how it comes out for you! Thank you for this site. could you tell me what Advieh I should use? If you buy your advieh make sure it is a rice advieh. Hi, am a great fan of iranian dishes. A friend got me vacume packed sour cherries but they are not dry cheries. They seemed to have been packed with their juices. Can you direc me how to use them for the albaloo polow. Will appreciate all the help. Dolly, have you tried them? First and foremost you have to remove the pit. Then taste them to see if they have been cooked in sugar. If not then I would proceed the same way I did. If they are sweet then just layer the rice with them. I hope this helps! Great blog. I’m writing a novel where there are references to Persian food. It was great to read about different Persian dishes on your blog. Thanks. Pam, thank you and welcome!!! I think it’s fantastic that you teach how to make Persian food to your kids. It’s definitely important to pass on our cuisine to the younger generation! Thank you for this new recipe for my favorite Polo. Many years ago, I wanted to make Alobaloo Polo, but could not find sour cherries, as they had had a bad season, with little production. 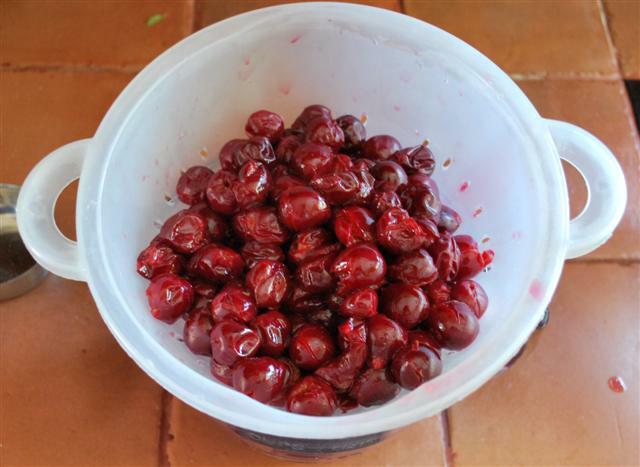 I substituted under-ripe fresh Bing cherries (It took quite a lot of picking through the bin at the market to eliminate the ripe and over-ripe ones! ), and adjusted the sugar downwards, and it ended up quite delicious. I really like your website, the way you take pictures of every step and explain everything in detail is really helpful. I love cooking and specifically Persian cuisine and I visit your website and learn new tricks everytime. Thanks a lot for making such an effort to keep us all informed and teach us new things. It is just so much fun to visit your website and you yourself seem so sweet. Zohreh, thank you so much for your kind words and readership! Thanks a billion! Although originally Persian, I grew up in Europe and had never made rice on my own. This recipe turned into a visual and gustatory success at a food fest thanks to your meticulous instructions. The tahdeeg was somptuous. Merci! I have a sour cherry tree in my front yard that is ready to be harvested this week. I CAN’T WAIT to make this recipe! do you have a chicken recipe you would recommend to go with the rice? 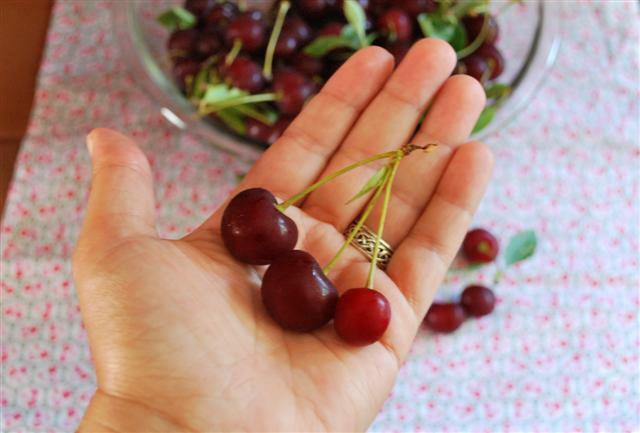 thank you for this great post, i bought frozen, sweetened cherries yesterday at iranian market, and there was no recipe on my book! but i am unclear about 1 thing; when you first say add the rice with yogurt it is hard to see, did you just mix the rice and yogurt and then put in pot? also, did you grind the zafran into a powder first? This is one of my favorite dishes, and I can’t wait to try your recipe! I know sour-cherry season is long over now, but maybe I can find some unsweetened dried ones… I’m on a mission! I just discovered your blog and had to comment on this, because I am so happy to find another Persian who doesn’t like food that is too sweet. (My parents completely picked the wrong name for me.) To me it is funny that Persians like tangy yogurt and raw, sharp onions, but also some dishes that to my taste are sickly sweet. I love this dish with lamb and would like to make it. Would you change this recipe with the lamb? Any helpful suggestions? When is sour cherry season? And where are you? I live in Ventura, CA, near LA. Anyone found fresh sour cherries in Southern California? Katie, you can make this dish with lamb if you want to. 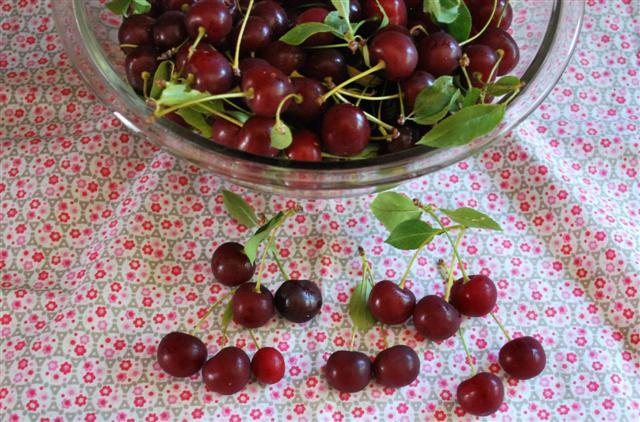 Sour Cherry season is around June. There are Sour Cherry orchards in Leona Valley near LA. Look up Cherry Tyme and ask to be put on their email list so that you can notified when you can purchase some directly from them. the recipe was fantastic! thanks a lot! I live in Australia and now is the end of sour cherries season. I went through Internet and found your recipe the best one! This recipe is very amazing…. i have also a suggestion. As far as i know people in all over the world love Tahdig in Persian recipes so how about devoting a little time for explaining Tahdig and how to have a nice Tahdig for example Tahdig with egg and yogurt , sliced potatoe or grated tomatoe tahdig(these are also delicious). besiar az zahamate shoma mamnunam.